Sainted Arsenii, Bishop of Tver', was born at Tver', and in his early years took monastic vows in the Kievo-Pechersk monastery. Even among the monks of this ancient monastery, distinguished for their piety, Arsenii was noted for his saintly life – a strict keeping of the monastic vows, a knowledge of the Church ustav, the study of Holy Scripture, and a love for work. Under the Kiev metropolitan Kyprian (1380-1382) he served as archdeacon, and during times of the metropolitan's absence he governed the working of the Kiev metropolitanate. 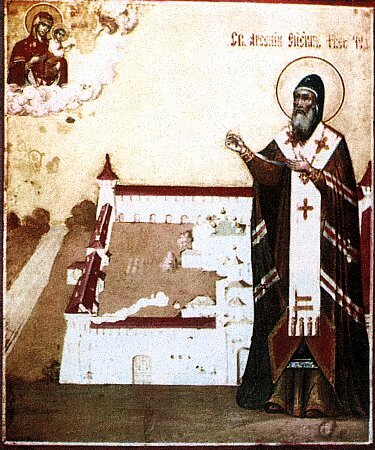 On 3 July 1390 he went together with Metropolitan Kyprian to Tver', where at the request of the Tver' prince Mikhail Aleksandrovich there had been convened a Sobor of Russian and Greek hierarchs for judgement upon the Tver' bishop Evphymii. The prince and the bishop were in a lengthy quarrel, and many of the Tver' people had serious accusations against the Tver' bishop. After unsuccessful attempts to restore peace to the Tver' church, Metropolitan Kyprian "removed from the episcopacy" Evphymii and sent him off to Moscow to the Chudov monastery. Saint Arsenii was appointed to the Tver' cathedra. But he, "fearful to accept the authority at Tver', in view of the much enmity and spite there, was both troubled and terrified". Upon the return of Metropolitan Kyprian and archdeacon Arsenii to Moscow, the Tver' prince sent his boyars with a petition to the metropolitan concerning ordination of Arsenii to the Tver' cathedra. This time also Arsenii was not agreeable. In the words of the chronicle for the year 1390 "hardly even by the metropolitan's entreaty would archdeacon Arsenii be at Tver'". Under the threat of cathedral suspension metropolitan and prince finally received his assent to the ordination, which was done 15 August 1390. Among the bishops taking part in the laying on of hands was Sainted Stephen, Bishop of Perm (Comm. 26 April). Having come upon the cathedra, Bishop Arsenii, as a man of great prayer and peace-maker, was able to stop much of the discord in the Tver' principality. During his episcopacy, from 1390 to 1409, there were built and consecrated cathedrals in honour of the Archangel Michael at Staritsa and Mikulina, and the Saviour-Transfiguration cathedral was restored with the putting up of a cathedral bell-tower. The saint founded on the river T'maka near Tver' the Zheltikov monastery, where in similitude to the Kievo-Pechersk monastery was built a church in the names of the Monks Antonii and Theodosii of Pechersk (1394), and a stone Uspenie cathedral. Desiring that the monks of this new monastery would always take edification from the asceticism of the Pechersk Fathers, Sainted Arsenii gave orders to compile a list from the Kievo-Pechersk Paterikon, offering the most ancient of redactions surviving into the present of this precious memorial of Russian literature, and receiving the name of the Arsen'ev Redaction. The saint died on 2 March 1409, and was buried in the Zheltikov monastery of the Uspenie / Dormition of the MostHoly Mother of God, which he founded. In 1483 his relics were found undecayed and placed in the monastery cathedral. In the same year priest-monk Feodosii wrote the Life and a Kanon of the Sainted-bishop. At a Sobor of 1547 was established the celebration of Sainted Arsenii throughout all the Church.